Pharmacist jobs in CDMO based on mark percentage and certificates verification through walk in interview. These CDMO pharmacist and ANM posts comes under NHM. There are total 16 paramedical vacancies available in Kandhamal District, Parbhani office of the CDMO. Applications will be received through walk in interview mode only. Candidates have to download the application form through the Kandhamal District website @www.Kandhamal.nic.in. The filled application form to be submitted at the office of the Chief District Medical Officer along with all testimonials on or walk in interview date 15-12-2017 by 10:00 AM. Selection for this CDMO Kandhamal District Pharmacist, ANM vacancies will be based on educational qualifications percentage of marks only. Based on the candidates academic percentage a preliminary merit list or short list will be prepared for certificate verification. All these process will be held on the same walk in interview date itself. For more of CDMO Kandhamal District Pharmacist, ANM, Junior Laboratory Technician Jobs read the below given details. 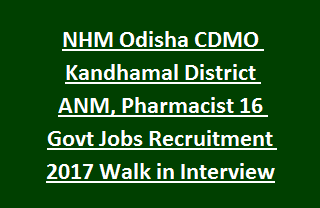 There are total 16 vacancies available in NHM CDMO Kandhamal District. These vacancies are on contractual basis only. For Pharmacist, Junior Lab Technician, Junior Radiographer posts age limits are 21-32 years. For Attendant posts -18-32 years. 5 years of upper age relaxation is given for SC/ST/SEBC candidates. For Pharmacist- +2 Science exam Diploma in Pharmacy from any recognized university or institute. Should have registered with Odisha Pharmacy council. For Junior Radiographer: +2 Science with 3 years diploma course in Medical Radiation Technology and registration with Odisha council. For Junior Lab Technician: Diploma in Medical Lab Technology with +2 Science Examination and registration with Odisha Council. For Attendant post 7th Exam qualification is required and candidate must be able to read and write Odia. For all the other posts candidates must have studies Odia upto matriculation level. A merit list will be prepared based on candidates marks percentage from their educational qualifications. Only those candidates will be called for certificate verification or interview. Merit list or Short list details will be uploaded in official website of Kandhamal District @www.kandhamal.nic.in. Candidates can download the application format form official advertisement and fill all the details with candidates own handwriting and attach all the related documents. Attend the walk in interview along with application form and required documents at office of the CDMO Kandhamal district on 15-12-2017 by 10:00 AM.